We must have a periodic pie to reward ourselves for being good boys and girls. Squash casserole is also a good stress reliever except that it’s good for you—but it’s still a wonderful comfort food. Growing your own squash is good for meditation. All it takes is a flower pot and some potting soil. What you get is simplicity, a pretty flower, and some delightful fruits (that some folks call a vegetable). 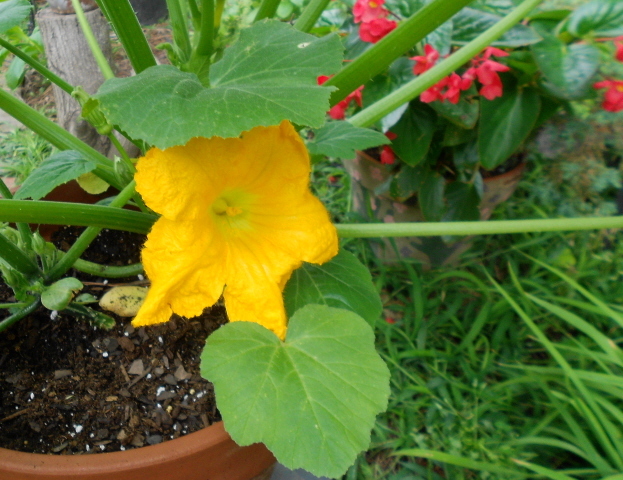 The squash plant–good for meditation and food. Previous On Transitions and Crossing Bridges… Next Imagine, What’s on the other side of the shadows? I am not planting plants as a dress reliever, I am planting rocks………I am making a rock walkway from the porch to the driveway and it has certainly helped me deal with stress levels.